Ritonavir is a Cytochrome P450 3A and Protease Inhibitor; Also inhibits Cytochrome P450 2D6, P-Glycoprotein and induces Cytochrome P450 2C19, Cytochrome P450 1A2, Cytochrome P450 2C9, Cytochrome P450 2B6 and UDP Glucuronosyltransferases. Lopinavir is a potent HIV protease inhibitor with Ki of 1.3 pM in a cell-free assay. Sodium butyrate and lopinavir treatment represent pharmacological aging models that reproduce key properties of cellular aging. LLC-PK1 cells were incubated with vehicle (controls), sodium butyrate or lopinavir and assessed for different indicators of aging. (A) The number of cells that scored positive for SA-β-galactosidase activity increased significantly upon treatment with sodium butyrate or lopinavir. Data are shown for three independent experiments as average + SEM. Results were normalized to controls and depicted as arbitrary units (AU). (B) Sodium butyrate and lopinavir increase cell size, cause nuclear dysmorphy, reduce cell proliferation, while lamin A becomes more abundant. Confocal images were acquired for 5-ethynyl-2′-deoxyuridine (EdU) and lamin A (Materials and methods). Representative images are shown for control and treated samples. Scale bar, 20 μm. (C) Nuclear fluorescence was quantified for EdU and lamin A for at least three independent experiments. Pixel intensities were measured for > 100 cells for each experiment per condition. NaBu, sodium butyrate, D, DMSO, Lopi, lopinavir. **, p < 0.01; ***, p < 0.001. Atazanavir Sulfate is a HIV protease inhibitor with Ki of 2.66 nM in a cell-free assay. Protease inhibitors induce macroautophagy. JEG3 were seeded on glass chamber slides (1 x 104 cell per chamber; 8-well μ slides; Ibidi, Martinsried, Germany), grown for 24 h under cell culture conditions, and treated for 24 h with 0-10 ug/ml of either lopinavir/ritonavir or atazanavir. Cells were then incubated for 30 min with the blue-green fluorescent autophagy marker monodansylcadaverine and viewed under a fluorescence microscope. Darunavir Ethanolate (DRV) is a nonpeptidic HIV protease inhibitor, used to treat HIV infection. 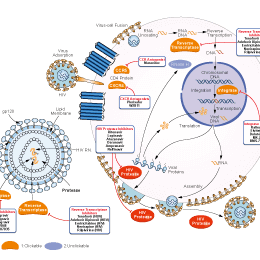 HIV PIs variably alter intracellular HIV epitope stability. (A) HLA-A02–restricted SL9 epitope (SLYNTVATL, aa 77–85 in HIV-1 Gag p17) was degraded in PBMC extracts pretreated with DMSO (control, circles), 5 µM of Nelfinavir (triangles) or 5 µM of Saquinavir (squares). Remaining peptide was quantified by RP-HPLC analysis after 0, 10, 30 and 60 minutes. 100% represents the amount of peptide at time 0 calculated as the surface under the peptide peak detected by RP-HPLC (815.986, 821.569, and 813.118 for DMSO, Saquinavir, and Nelfinavir, respectively). Times at which 50% of the SL9 peptide remained correspond to peptide half-lives (37 min, 52 min and 24 min for Control, Saquinavir and Nelfinavir respectively). (B–F) HLA-A02–SL9, HLA-B57-KF11, HLAB57-ISW9, HLA-B57-TW10 and HLA-A11-ATK9 epitopes (from B to F respectively) were degraded in PBMC extracts pretreated with DMSO, 2 µM or 5 µM PI (Saquinavir, Ritonavir, Nelfinavir, Atazanavir or Darunavir). The cytosolic half-lives in control condition were 33.87, 25.66, 14.83, 119.4 and 37.21 minutes for SL9, KF11, ISW9, TW10 and ATK9 respectively. Fold differences of each epitope half-life upon treatment compared to control are presented in each panel. All data represent the average of 4 different experiments using 4 different PBMC extracts. *P < 0.05, **P < 0.01, ***P < 0.001, 1-way ANOVA with Dunnett’s post-test. Amprenavir is a potent PXR-selective agonist, and an HIV protease inhibitor, used to treat HIV. Indinavir sulfate is a specific and potent inhibitor of HIV-1 protease and is widely used in the treatment of AIDS. Raltegravir Potassium is the orally bioavailable potassium salt of raltegravir, the first approved human immunodeficiency virus type 1 (HIV-1) integrase inhibitor. Limonin is a triterpenoid enriched in citrus fruits, which has antivirus and antitumor ability.